Volvo Trucks’ New FH has been elected International Truck of the Year 2014 by a group of 25 senior commercial vehicle journalists, representing 25 magazines throughout Europe with a total readership of more than 700,000 transport operators. The prestigious award was handed over to Claes Nilsson, President of Volvo Trucks, during the COMTRANS commercial vehicle show in Moscow. In a neck-and-neck competition, with its winning score of 116 votes the Swedish heavy-duty truck fought off a strong challenge posed by DAF Trucks’ New XF, which collected 105 votes in second place. Mercedes-Benz’s Arocs range of construction vehicles finished in third place, while the Scania Streamline and MAN’s Euro-6 range were fourth and fifth respectively. According to the International Truck of the Year rules, the annual award is presented to the truck launched in the previous 12 months which has made the greatest contribution to road transport efficiency in terms of innovation, comfort, safety, driveability, fuel economy and reducing exhaust emissions and total cost of ownership (TCO). 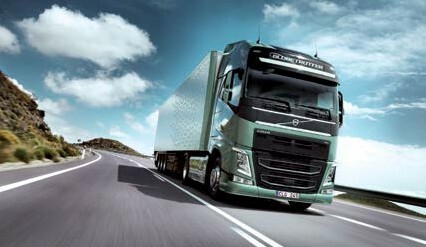 Volvo Trucks’ New FH is a hi-tech long-haul truck that sets a new standard in the automotive industry. Its all-new cab has a stylish Nordic-design interior characterised by smooth contours and soft colours, creating a quiet and comfortable workplace for long-distance truck drivers. Its main instrument cluster â with digital display and essential dials in the centre of the dashboardâ proved to be both effective and extremely user-friendly. Thanks to upright A-pillars and innovative rear-view mirrors with revised, less-obtrusive mirror-housings the New FH cab also offers improved all-round-driver vision. Equally impressive is the performance of the Volvo driveline. The jury praised the combination of the New FH’s I-Shift automated transmission along with Volvo’s ‘I-See’ terrain-mapping software package which reduces fuel consumption, and offers smooth and predictive gear- changing based on the route the truck is driving on. The New FH’s ride-and-handling characteristics are further enhanced by increased cab roll- stability, improved steering, and the option of independent front suspensions (IFS). Finally, thanks to the Telematics Gateway communication unit, the New FH series truck can be remotely monitored by Volvo workshops in order to minimize maintenance and repair costs, a key factor in today’s tough business environment that requires lower total cost of ownership (TCO). Summing up the jury vote, International Truck of the Year chairman Gianenrico Griffini commented: “Volvo Trucks has delivered a completely-new heavy-duty truck which, with its innovative cab, hi-tech driveline components and advanced maintenance solutions sets a new benchmark in the automotive industry”.